Description: This is Driftwood’s 7th Vintage of this annual December release beer. 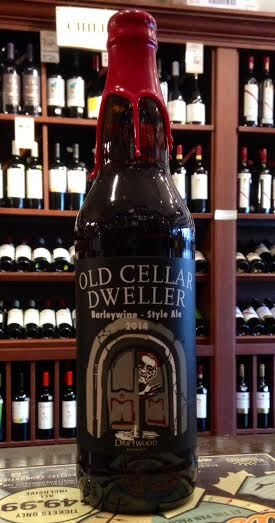 This year, the Old Cellar Dweller is even stronger, with five times the malt and three times the hops of regular beer, and an alcohol per volume rating of over 13%. It also consisting of 98% Pale Malt and a bag of CaraMunch thrown in for color, and a single hop variety (Columbus) in heavy concentrations. Tasting Notes: Much like last year’s offering, this year’s OCD (ha!) was more akin to an Imperial IPA than a barleywine. It’s malt is rich and delicious (though a bit lightly colored), but the hop-forward nature really comes through with overwhelming notes of pineapple. It’s also quite smooth despite its strength, and very pleasant-tasting, but not exactly reminiscent of an English-style barleywine. Top marks for drinkability, minor deduction for mislabeling. This entry was posted in BC Beer, Reviews, Seasonal Beer and tagged barleywine, CaraMunch malt, columbus hops, Driftwood brewery, Driftwood Old Cellar Dweller 2014, pale malt, seasonal beer by storiesbywilliams. Bookmark the permalink. Well that is a bummer. I was hoping this year they would be back to a real barleywine. Being one of my favourite styles I hold these to a different standard. I had a second bottle the other day, and the flavor was somewhat different. Less fruit, more malt and a bigger alcoholic burn. I’m sensing the Geek is right, more aging! I’ve always been a bit dissapointed by this one, I have a few of the 2013 version just to see if age helps.